This Precious Metal Is on Verge of Going "Pyrotechnic"
Gold and silver markets opened slightly lower on Monday morning after getting hit last week with a double whammy of dollar-bullish news items. Yet despite both dollar strength and gold/silver weakness last week, the palladium spot price advanced more than 2% and is now on the verge of a major technical breakout. On Thursday, the European Central Bank announced a cut of 25 basis points in its short-term lending rate. The move hurt the euro, aided the dollar, and pressured gold and silver prices lower. Then on Friday, the government released a better-than-expected jobs report. Mainstream media outlets touted it as "good news for the economy." However, as is usually the case with official economic reports, a look behind the numbers that generate the headlines reveals a very different picture. Even as 204,000 jobs were supposedly "added," the actual labor force participation rate fell to 62.8% – the lowest since Jimmy Carter was president! After last week's economic data, investors shouldn't be the least bit encouraged that the economy is strong enough for the Federal Reserve to take it off life support. Interestingly, while gold prices fell on the week, the HUI gold miners index managed a small weekly gain (+0.6%) despite the negative news headwinds. This positive divergence could be a fluke, or it might be a sign that investors expect gold prices to start firming up soon. For the first time ever, you can now purchase silver junk bags in increments of just $10 face value, which contains 7.15 ounces of silver. Grab a few bags of these 90% silver dimes/quarters or half dollars online right now! Last week's Market Wrap podcast featured an interview with veteran precious metals and mining industry analyst David Smith. In addition to weighing in on the diminution of output from gold and silver mines, he spoke favorably about the fundamentals of the platinum group metals. "Platinum and palladium are likely to break out to new highs before gold and silver based upon their own fundamentals," he said. "It could be very much pyrotechnic when this happens. There's a tremendous deficit that's building in both of these metals. 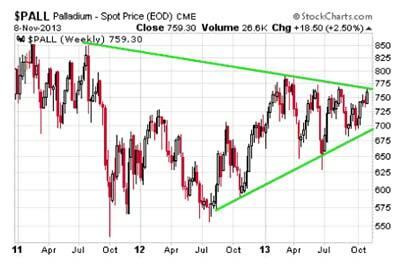 And as I look at the charts today, palladium of the four metals has the strongest technical chart position right now." 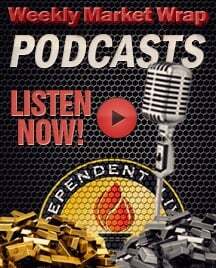 You can read or listen to the rest of our exclusive David Smith interview here. Palladium's gains last week caused prices to run into a descending line of resistance that they've been contending with for more than two years. Palladium prices have been consolidating in an increasingly tight wedge pattern. Eventually, they'll break out of the consolidation in one direction or the other. A strong weekly close above last Wednesday's intraday high mark of $765/oz would suggest that a major new uptrend is in progress. Further confirmation would be a close above $785 – representing the 2013 high. Tuesday, Nov. 12th – Speeches from Federal Reserve Officials. Dallas Fed President Richard Fisher, Minneapolis Fed President Narayana Kocherlakota, and Atlanta Fed President Dennis Lockhart are each scheduled to deliver major speeches. Wednesday, Nov. 13th – Ben Bernanke Speaks. The Fed chairman will hold a town hall meeting in Washington. Though no official policy announcements are expected, markets may react to any language hinting at future policy direction, especially as it pertains to the current program of Quantitative Easing. Thursday, Nov. 14th – Jobless Claims. Initial jobless claims fell by 9,000 in the last report. Consensus is for another decline of about 6,000, for a total of 330,000 new claims.